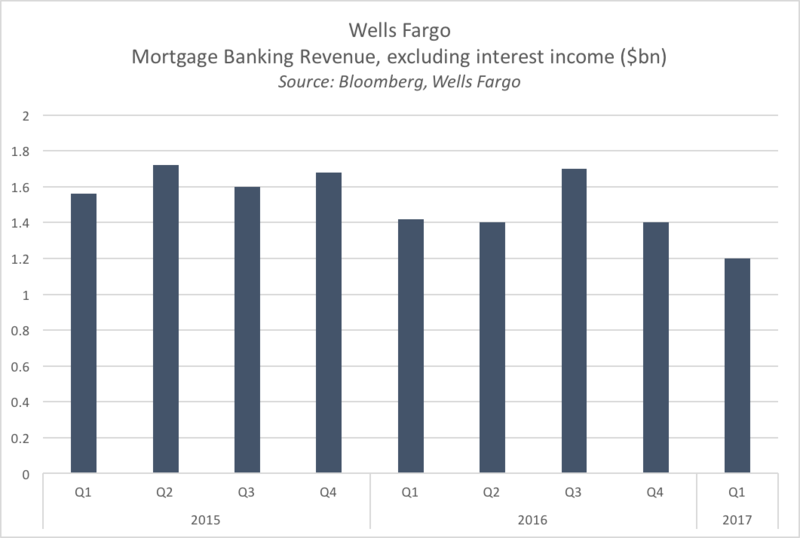 The US bank earning season showed a hot start for Citigroup and J.P.Morgan Chase & Co., while a less impressive performance was presented by Wells Fargo from the beginning of the new year, as the three megabanks released their first quarter results for year 2017 on Thursday 13th April. 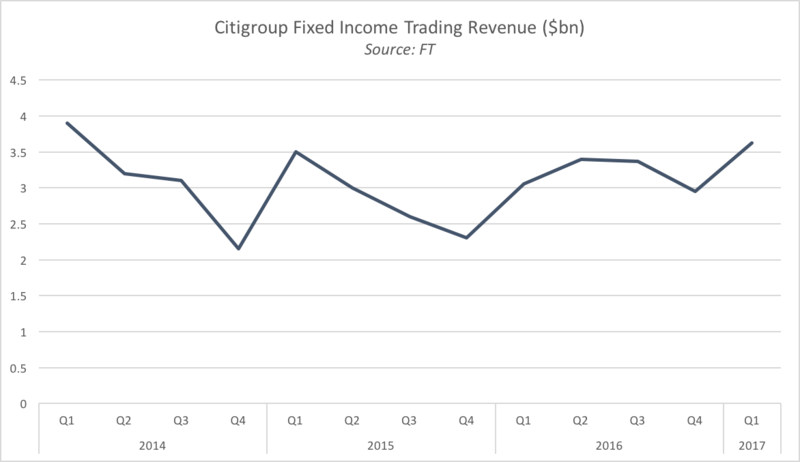 Starting from the first, Citi records a 17% rise in quarterly profits from $3.5 billion in the first three months of 2016 to $4.09 billion during this year, boosted by the revenue growth in the institutional business of the bank. The result exceeded by far the $3.41 billion target, set by Wall Street analysts’ expectations, which were also underestimating by $680 million the revenue figure (which had a 3% increase to $18.12 billion overall). The main driver of Citi’s great performance was its Wall Street business, which saw the aforementioned revenues from the institutional clients division, as well as the ones originated by the Investment Banking division and the Fixed Income trading unit, soar by 16%, 39% and 19% respectively. The Consumer Banking segment reached instead a more modest 1% in revenue growth. ​The sound performance by Citigroup recalled stability at J.P.Morgan Chase, the biggest US bank by assets, which also unveiled better profits than the ones expected. Shares at J.P.Morgan, which are often seen as an indicator of the health of the American economy, have been rising about one quarter since the presidential election in November, following from the optimism of investors in Donald Trump keeping his promises of higher interest rates, lower taxes and lighter regulation towards the financial sector. However, results show that, at least until now, investment bankers and traders have been reaping the majority of the benefits produced by the Trump administration. Net income from the Corporate and Investment Banking division of J.P.Morgan hit a record-breaking $3.2 billion, skyrocketing 64% from the same period of last year. The boost in investment banking fees, up more than a third at $1.7 billion, derived from rising fees for underwriting debt and equity deals, and pushed revenues for the division up by 17 per cent to $9.54 billion. 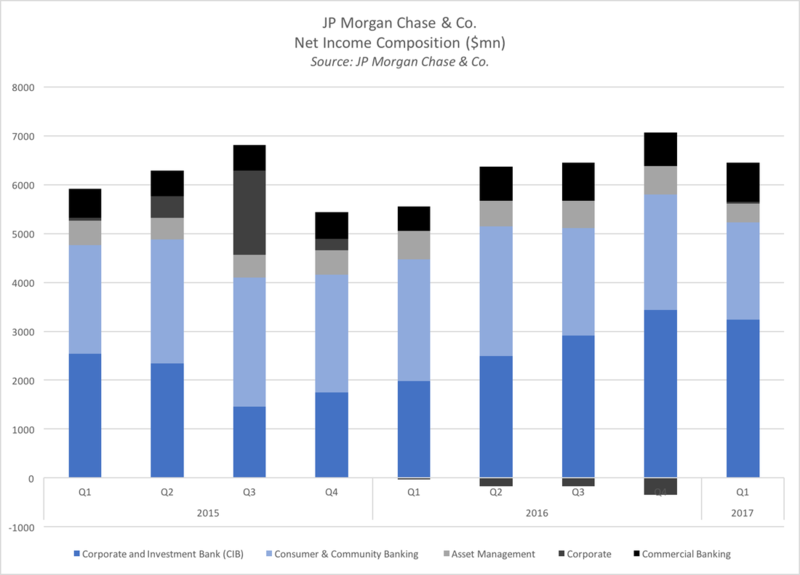 The Retail Banking outcomes however, as it was for Citigroup, were not exciting, with net revenues falling 1% from last year, following a reassessment of credit quality and consumer exposure. Overall, Earnings Per Share (EPS) of both institutions outperformed forecasts by approximately 9%. ​The outstanding start of the two former banks was not matched by the retail-focused Wells Fargo, still recovering from its client account scandal. Six months ago the bank settled a class-action against its aggressive business practices dating back 2002 for $110 million, but the repercussions of the illicit procedures are likely to affect its performance for a long time. The wrongful behavior of several Wells Fargo’s employees and executives, responsible for having opened millions of unauthorized customer account to hit sales targets, caused a huge damage to the image of the company, and originated a probe that, according to Democrats on a congressional committee, is “far from over”. In addition to this company-specific issue, the emerging trend in the bank earning season – the consistent failure of consumer banking to keep the pace of the resurgence of Wall Street business – the disappointing figures of the first quarter for the second-biggest US bank by market capitalization are not surprising at all. The lack of a strong Investment Banking division, compared to Citi and J.P.Morgan, made Wells Fargo hardly hit by the persistent pressure on the US retail banking industry, despite the increasing interest rates, which should give some oxygen to its net interest margin, fallen from 2.90% of one year ago to 2.87% now. Mortgage Banking revenues have been the lowest in 2017 first quarter, compared to each quarter since January 2015, and have been constantly falling for the last seven straight months. Shares are down 12% from mid-March, following a $764 million increase in operating expenses, mainly deriving from charges for “outside professional services” (Source: FT https://www.ft.com/content/9f45c83e-203d-11e7-b7d3-163f5a7f229c), namely, lawyers, consultants and “risk professionals” hired to stem the impact of the scandal. Wells Fargo still managed in beating, albeit slightly, Earnings Per Share forecasts, hitting $1.00. The clear pattern that appears from the analysis of the first quarter results of three of the most powerful American banks is the slowing down of commercial and industrial lending, the “traditional” business of the Financial Services industry, in opposition to a dramatic recovery in Investment Banking and Trading. Has this macro trend been confirmed, more recently, by the three other megabanks? Bank of America Corp., achieving its third successive rise in quarterly profits, published on April 18, and beating by 40% the 2016 first quarter net income results would suggest an affirmative answer. ​Particularly eye-catching, once again, were the figures related to Investment Banking fees, climbing by a third, and to fixed income, currencies and commodities trading, which benefited from a 29% surge in revenues to $2.93 billion, attributed by analysts to the "Trump trade" effect. ​An authoritative voice, though, raises concerns against the rising optimism in the banking sector. It is last minute news the first miss, in six quarters, of analysts’ EPS expectations by Goldman Sachs, whose Chairman and CEO Lloyd Blankfein attributed to a “mixed” operating environment, “with client activity challenged in certain market-making businesses, and a more attractive backdrop in underwriting in the investment banking franchise” (Source: FT https://www.ft.com/content/8ab624ce-2437-11e7-8691-d5f7e0cd0a16). Goldman’s failure in capitalizing on the “bonanza” exploited by competitors in debt trading, the bank’s core business, took experts by surprise, causing a 3.7% drop in the New-York based bank stock value, down to $217.83, which could result in the lowest closing level since November 29, according to Bloomberg data. On the other hand, the institution increased its profits by a stunning 80% compared to last year's opening quarter, Goldman’s worst since 2004, but this excellent result may still not be enough to keep up with competitors and satisfy investors: a challenging year is ahead if the ambitious target of quarter-by-quarter improvement of 2016 is to be replicated. ​In the next hours, Morgan Stanley will follow suit in publishing its own first quarterly results for 2017. By now, it should be clear that identifying a common driver of industry-wide performance is no guarantee for predictability, as far as individual earnings updates are concerned. Staying up to date with the news is the best strategy not to be taken by surprise.